It's Nonfiction Monday, and today I'm featuring a book I absolutely love! Parents, if you’re struggling to find books that interest your reluctant readers, I think I’ve found THE PERFECT BOOK for you! I won a copy of Do Not Open: An Encyclopedia fo the World's Best Kept Secrets by John Farndon from Breeni Books over the winter holidays, and I can’t even begin to tell you the numerous times I’ve picked this up and read pieces of it since. Do Not Open comes in its own silver vault that begs readers to open it, and the book itself is chock full of fascinating facts from ships and aircraft that have disappeared in the Bermuda Triangle to the eerie similarities between Abraham Lincoln and John F. Kennedy. Each section features colorful two-to-four page spreads that examine mysteries, hoaxes, optical illusions, bizarre facts, and more. Many spreads are interactive and feature flaps or pull out pages. “Conspiracy Theories:” This four-page feature discusses some of the most well-known conspiracy theories, including the theory that the US staged the 1969 moon landing in the Nevada desert, the rumor that Marilyn Monroe was murdered, and that Mozart was poisoned. Readers can choose to read the book from front to back or flip through and read what interests them—a great choice for kids who may not like to read long stories. I tend to open it up and read whatever comes to me. In addition, there is such a variety of stories that anyone who picks it up will find something that interests them. This book would make a perfect gift for kids of all ages!!! I’m coming in with a day to spare to complete my March reading for the Young Adult Challenge hosted at Thoughts of Joy. For this challenge, I committed to read the last 12 Newbery Medal winners in effort to read more Newbery books. So far, I’ve read Kira-Kira and The Higher Power of Lucky. This month, I read the 2004 Winner, The Tale of Despereaux, and I was not disappointed. The Tale of Despereaux has everything I look for in a good fairy tale: a hero, a damsel in distress, an evil villain, and an exciting plot, full of suspense, where ultimately good triumphs over evil. Kate DiCamillo brilliantly includes all of these elements in an unconventional and quirky way that kids will love. Our hero, Despereaux is a tiny mouse with “obscenely large ears” who lives in a castle with his large mouse family. The runt and only survivor of his mother’s last litter, he has always been different and a source of embarrassment for his family. In addition to his size, he doesn’t enjoy hunting for crumbs and prefers reading books instead of eating them. He even commits the ultimate offense of talking to humans and even let one, the beautiful Princess Pea, touch him. GASP! It’s this offense that sentences him to be eaten by rats in the dungeon. He manages to escape this sentence but soon has to return as he sets upon his quest to save the Princess. Our villain is the rat, Chiaroscuro, Roscuro for short. He led a normal and rotten rat life in the dungeon until a match was lit in front of his face, and he began to crave light. It’s this craving for light that brings him up into the castle and ultimately results in the Queen’s death. Something happens during this incident that causes him to hate the Princess Pea, and he develops a plan to destroy her. Our damsel in distress is the kind and lovely Princess Pea who manages to make Despereaux fall in love with her at first sight. But she’s actually kind of boring—the character I liked the most was Miggery Sow. Named after her father’s favorite pig, Miggery Sow’s, Mig for short, mother died when she was a young girl. Her father sold her for a red tablecloth, a hen, and cigarettes to a cruel man who “clouted” her on the ear so much that she lost part of her hearing and ended up with ears that resembled cauliflowers. A stroke of luck gets the slow-witted Mig a job at the castle, where she desperately wants to become a Princess. Roscuro uses this to his advantage and tricks Mig into helping him execute his plan to destroy the Princess. Readers will feel sympathy for Mig as they learn about her background, but will also roll with laughter when she misinterprets what people say to her because her poor hearing. So what made this book win the Newbery Medal in 2004? I think it’s because Ms. DiCamillo skillfully weaves in some great themes that can lead to many discussions, including accepting differences, living with honor, treating others with respect, the power of hope, and more. She manages to do all this through a charming story that children of a variety of ages will enjoy. It’s fast-paced and a great choice for a read aloud to younger children, and kids who are in the 8-10 range will be able to read it with ease. Kids above ten may like it but pretend it’s too childish, but I don’t want to give off the impression that it’s meant solely for younger children. Along with its lighthearted and funny parts, there is death and a little violence. But here’s how the narrator explains one part that is particularly dark. If your kids are Harry Potter fans, these parts are certainly not as dark as scenes in those books—not even close in fact. I wouldn’t have a problem sharing it with younger children, but be prepared to explain these issues if your young kids have questions. I finished this book about two weeks ago and have sat down numerous times to write my review, but I’ve actually a hard time explaining it and wrapping it up into a succinct little description because it’s different than any other book I’ve read, but in a good way. In fact, I don’t think I’m doing it justice now. The bottom line is that I highly recommend it, and I think you and your children will like it just as much as I did. Do you have a review of The Tale of Despereaux? If so, leave a comment with the link, and I'll post it here. March has definitely been hectic, but things seem to be calming down, and I'll be able to resume more of a regular schedule on The Well-Read Child next week. Regardless of how busy life and work have been, I've still managed to read to my daughter every evening. However, because my reviews require brainpower (none of which has been left at the end of some pretty long days recently), I haven't written many. I do have a huge stack of books waiting to be reviewed, so they're coming! Tomorrow, look for my review of The Tale of Despereaux, Kate DiCamillo's 2004 Newbery Medal winner. I also have a few nonfiction selections I've read but haven't yet decided which one I'll feature for Nonfiction Monday. Here's an interesting exercise: write a 19 line poem with just two rhyming sounds, and in which about a third of the lines are refrains. The first stanza haunts every other -- its first and third lines alternating as conclusions to the stanzas that follow, until they come together to end the poem as a couplet. Do that and you will have created something called a "villanelle." Below I've included a) a great villanelle by Theodore Roethke and b) my own attempt at the form. If you're inspired to try your own hand at this, please feel free to post the result as a comment to this post. (It's a very fun excercise; learn more about the villanelle and how to write one here; for another famous example, see Dylan Thomas' Do not go gentle into that good night). "Know I would only ask it of a few"
"There is one small thing I would have you do"
"There is one small thing I would have you do." Know I would only ask it of a few. Visit the rest of the Poetry Friday roundup at Cuentecitos today! Today, I'm pleased to present the first review from Marlies, our newest contributor. Enjoy! Last spring, I had a plastic thumb. When my neighbors were asleep, I’d sneak outside and poke plastic stems into my so-called garden. I couldn’t name more than ten flowers and far fewer trees, and I certainly didn’t know that Fireweed is the first plant to grow back in burned areas. But that was all before I read Girlwood, by Claire Dean. So is Girlwood a boring book about plants? Absolutely not. It’s a story that speaks to the hearts and minds of girls 12 and up and shows them that life can be filled with wonder and magic if they have the courage to hold onto hope. Polly, the main character, must believe that she can help her runaway sister survive in the Idaho woods—in winter, with wolves, and bulldozers. She gets her strength from her beloved grandmother, Baba, who shares the “secrets” of the woods that have actually been known for thousands of years. This book spoke to me. I know I won’t stab plastic convenience into the ground where wondrous nature belongs. And I bet, when faced with trouble, adolescents and young adults who read the book will remember Polly and find new ways to choose hope over self-doubt and fear. I've actually never read R.L. Stine's Goosebumps series, but I do know that starting at around age 12, I had a thing for dark books. I absolutely loved V.C. Andrews' twisted books like Flowers in the Attic and My Sweet Audrina and remember checking out one after the other in the library. When I got a little older, Stephen King and Dean Koontz were always in my book pile. Goosebumps is geared toward a younger audience than these books, so the series is not as dark and doesn't contain many of the more mature themes and language, but it definitely can give kids their horror fix. Via this NY Times article, R.L. Stine is back with a new Goosebumps series: Goosebumps: HorrorLand. The first in the 12-book series, Goosebumps HorrorLand #1: Revenge of the Living Dummy, will be officially released on April 1, but it's already available on Amazon. These are the types of books that kids can have fun with and that may turn some reluctant readers onto reading. My ultimate vision for The Well-Read Child is to have a wide variety of book reviews for children and teens and also a variety of voices via a number of select contributors. I've been overwhelmed with the response to The Well-Read Child by authors, publishers, and most importantly, you, the readers, and I've found myself with a giant stack of books begging to be read and reviewed. Marlies, an avid reader, mother of two, and aspiring young adult author offered to help out after shameless begging and offerings of free books and chocolate cake. She'll be reviewing and recommending books for middle graders and teens, and I'm so excited for you hear what she has to say. Please join me in welcoming Marlies to The Well-Read Child, and check in tomorrow when I'll post her review of Claire Dean's new novel, Girlwood. It's Nonfiction Monday over at Picture Book of the Day. Stop by and check out the nonfiction goodness everyone has to offer. If you haven't already peeked at the two nonfiction animal books I reviewed in the past week, take a minute to check them out. 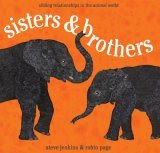 First, I reviewed Steve Jenkins and Robin Page's newest book, Sisters & Brothers, a picture book about animal sibling relationships. If your little ones love animals, they will definitely like this book. Second, I reviewed JG Annino's Florida's Famous Animals, a book for older kids about some Floridian animals who've made the news. In addition to reading their stories, kids can learn all kinds of fun animal facts and get links to more online resources. Do you have a favorite nonfiction book about animals? My baby girl just turned one, and it's only going to be a matter of time when she's not a baby but a little girl. I don't think I'm alone when I say that as a parent, I often wonder how I'm going to raise a strong, self-assured, and happy child. It's a daunting and sometimes frightening task to achieve what with bullying, poor body image, young children developing eating disorders, and so much more I read about in the news. I also know that however hard I may try, I can't shield her from everything, but it is my job to remind her often about how much she's loved and about her inner strengths, and I'm going to use The Twelve Gifts of Birth to help me. "The first gift is strength. May you remember to call upon it whenever you need it. The second gift is beauty. May your deeds reflect its depth. " Accompanying the text are sepia-toned photographs by Jill Reger and illustrations by Wendy Wassink Ackison that give the book a magical, dreamlike feel. What I like most about the book is its universal message that every person has these inherent gifts within them regardless of where they're from, what they look like, and even what they've done, and it's up to them to use them wisely and bring them out in others. While it's absolutely an excellent choice for any new or expectant parent, it would also make a great gift for anyone celebrating a milestone such as graduation, a new job, and for anyone who may be experiencing some sort of adversity. This book bridges all religious boundaries and is appropriate for people from all walks of life. As stated in a letter from Charlene Costanzo, it's been used in baptisms, bat mitzvahs, funerals, schools, churches, and even prisons. It is a book that I will cherish and that I will give often as a gift and that I would recommend to any parent. There are two other books in the series, The Twelve Gifts for Healing and The Twelve Gifts in Marriage. In addition, Charlene Costanzo has developed a website full of resources for readers, parents, and educators, including a free classroom curriculum. I'm always a sucker for books about animals, so I jumped at the chance when the author herself offered up a copy of this book for me to review. Florida's Famous Animals features the stories of 13 Floridian animals who've made the news. Dave, the Parade Cat, a feline who loved parades and actually led many by riding on the shoulders of his human, the "Catman." My personal favorite story in the book is that of Sunset Sam, a dolphin who was discovered stuck in a mud flap near death. We learn all about Sunset Sam's rescue and recovery and the disabilities that prevented him from being able to be returned to the wild. Each animal story also includes boxes with more information, fun facts, and links to more resources about that type of animal. For example, in Maya the Mystery Owl's story, we learn about some "Owl Oddities," and get a list of owl species that naturally prowl in Florida. Annino also includes links to online owl resources, including the Nature of Conservatory's site about the Owls featured in Harry Potter. My only wish is that the book would have included color photographs of the animals like we see on the cover instead of black and white. This is a book that older children will enjoy reading on their own, and younger children will enjoy hearing read to them. Floridians will especially enjoy reading more about the animals they've heard about in the news. I'm a longtime fan of Lois Lowry's--so much so that when I was teaching, I created units of instruction for The Giver and Number the Stars. You can only imagine how happy I was to learn that she was releasing another novel this year, but be warned those of you familiar with Lois Lowry's work--this is very different from her other works but oh so DELIGHTFUL. This Lemony Snicketish novel features the four Willoughby children who long to be "old fashioned," like the characters in many of the books they love like Anne of Green Gables, Jane Eyre, and James and the Giant Peach. Tim, the oldest, is the rather bossy leader of his siblings: identical twins Barnaby A and Barnaby B (A and B for short), and the youngest and timid Jane. It's very clear from the beginning that their parents are well--not that much into being parents. The banker father is "impatient and irascible," and their mother is "indolent and ill-tempered." They "frequently forgot that they had children and became quite irritable when they were reminded of it." They actually become so irritable with their children that they devise a plan to get rid of them by selling their house while they go on vacation. Little do they know that this adventurous (and highly dangerous) vacation is the children's plan to get rid of their parents so that they may finally become old-fashioned orphans. But things don't go EXACTLY as planned, and along the way, the Willoughby children learn a little bit about kindness and find a loving family of their own. I found myself snickering at the book from the very beginning, and it's actually kind of difficult to tie it up into a neat little description. It's dark yet irreverent and lighthearted at the same time. Lowry does a fantastic job of weaving in hilarious scenarios and funny characters, from the kind nanny who disguises herself as Aphrodite to scare off potential home buyers to the rich benefactor who made his fortune in the candy industry. I also immensely enjoyed the references to lots of classic "orphan" books she pokes fun of. But let me SHOW you what I'm talking about. In this passage, the children receive a postcard from their parents. "'Dear ones,'" Tim read. "'Though slightly bruised, we have survived quite a lovely earthquake (you may have read the headlines: THOUSANDS KILLED)...'"
"'Oh my," Jane said sadly. "I suppose kittens were killed, too. How sad." "Shhh," Tim told her, and he continued. '"...and next we are off to kayak a crocodile-infested river. Such FUN! '" "They don't know how to kayak!" Barnaby A exclaimed. "They never once have kayaked," his twin added. (Lowry herself sketched all of the illustrations in the book). I predict that children and parents alike will love this book even though some young children may not get all of the jokes. However, those that do will probably read it over and over again and find something new to laugh at every time. I admit that I was first a little skeptical when I heard that Lowry would be writing a humorous book, but like all of her books, she executed it with perfection and added her own special style. The Willoughbys will be officially released on March 31st, but it's available on Amazon.com now. My friend Jay was just telling me how his daughter Amelia loves going to the zoo and seeing all of the animals. Amelia also loves books, and I think I've found a book that she'll love. Sisters and Brothers: Sibling Relationships in the Animal World presents all kinds of information and fun facts about animal siblings. For example, did you know that nine-banded armadillos are ALWAYS born as identical quadruplets? Well, did ya? I bet you didn't know that there are no male New Mexico whiptail lizards or that cheetah brothers hunt together throughout their lives while the sisters separate from their families when they're two years old to start their own. Pretty cool, huh? The book features 19 different species of animals from elephants and beavers to European shrews and giant anteaters. Splendid cut-and-torn paper collage illustrations compliment each paragraph of intriguing information, and a fun caption accompanies each illustration. I especially love the caption by the black widow spider's egg sac: "I'm having my family for dinner..." Eeeeek! It's a challenge to write engaging nonfiction for young children, and Jenkins and Page have definitely risen to the challenge and created a book that children of all ages will enjoy. Even very young children who may not understand the text will be fascinated by the illustrations. I highly recommend this for any child who loves animals. Sisters and Brothers: Sibling Relationships in the Animal World won't be available until April 14, but it's definitely one to keep on your radar. I'm taking a little bloggy break this week to focus on some work projects that will require all of my brainpower. I'll try to post when I can. Have a fabulous week! Thinking of Bob Dylan's lyrics has made me start thinking about other songs that make great poetry. One song that I loved from the moment I heard it is Snow Patrol's "Chasing Cars." Jama Rattigan has asked us to share our favorite Dylan lyrics for Poetry Friday. I do admit that I'm not a huge fan of Bob Dylan's voice, but I do think he is an exceptional song writer. One of my favorite Dylan songs is Every Grain of Sand, and I particularly enjoy the last stanza. Listen to the song here and view some great art and photography while you listen. Check out the rest of the round-up at Jama Rattigan's Alphabet Soup. Last week, I shared my story of my favorite childhood series, Trixie Belden, and asked you to share your and your child's favorite series books. Can I just say, "Wow," and "Thank you, thank you, thank you!" So many of you wrote in with great recommendations, and there are tons of books I must now read. I'm working on organizing this wonderful list and writing short summaries of each one. I imagine I'll be presenting them in multiple posts, and I'll bring you the first list next week. In the meantime, if you didn't get a chance to list your favorite childhood series or your child's favorite series, please do so! I'm always on the lookout for books that celebrate different cultures, help children feel a sense of pride in their heritage, and encourage children to develop an understanding and appreciation of a culture that may be different from their own. In just 24 beautifully-illustrated pages, Niwechihaw/I Help, Caitlin Dale Nicholson's bilingual picture book in Cree and English achieves this. In the book, a young Tahltan* boy follows his "kôhkom," or grandmother through the bush picking rosehips. He observes and imitates her as she walks, listens, prays, etc., and along the way, learns more about his culture. Written in simple repetitive phrases, the Cree word is followed by the English word. "Kôhkom pimohtew./ Kôhkom walks./Nipimohtan./I walk." Nicholson's soft acrylic-on-canvas illustrations give the book a feeling of reverence and awe and focus on the beauty of the earth and the loving relationship between the boy and his Kôhkom. At the end of book is a recipe for rosehip tea, again written in both Cree and English. My only wish is that the book had a pronunciation key for the Cree words or an accompanying CD so children could hear the beauty of the language spoken by a native Cree speaker. This is a special book that Tahltan children will cherish. Nicholson's message to her children at the end of the book sums it up: "I hope you stay strong and proud of who are you as Tahltan people with good minds and hearts. This book reflects the education that the elders are giving you...."
Even if you're not Tahltan, Niwechihaw/I Help , is a great introduction to Native American cultures and will help your child develop an interest in and respect for different cultures. *The Taltan are a Native American people located in the northern British Columbia area. . Yesterday, I reviewed Tasting the Sky: A Palestinian Childhood, Ibtisam Barakat's gripping account of her childhood growing up on the war-torn West Bank. As I mentioned in my review, found here, I found myself wishing to know more about the history of the war and of the long, ongoing conflict between Israel and Palestine. But given the fact that Barakat stayed with the viewpoint of a young child, that kind of information just wouldn't have worked in this particular book. After reading the book, your children and students will be likely to have questions about the war and the continuing conflict that has been ongoing for decades. Social Studies for Kids This site gives a basic overview of the conflict. The Israeli-Palestinian Conflict in a Nutshell A more detailed overview, with lots of links for more information. From booklist: " 'They murdered my friend.' Growing up separate and apart in a world of bombs, bullets, removals, checkpoints, and curfews, 20 Israeli and Palestinian young people talk about how the war has affected them. The author of Parvana's Journey (2002) and other novels about children in Afghanistan moves to nonfiction with 20 stirring first-person narratives by Jewish, Christian, and Muslim young people she interviewed in 2002. An accessible historical overview that is fair to all sides leads off, followed by brief individual profiles of the kids, which include a small photo, and the words of kids, who are traumatized, angry, hopeful, hateful, despairing, brave." Book description from Amazon: "In this stirring anthology of sixty poems from the Middle East, honored anthologist Naomi Shihab Nye welcomes us to this lush, vivid world and beckons us to explore. Eloquent pieces from Palestine, Israel, Egypt, Iraq, and elsewhere open windows into the hearts and souls of people we usually meet only on the nightly news. What we see when we look through these windows is the love of family, friends, and for the Earth, the daily occurrences of life that touch us forever, the longing for a sense of place. What we learn is that beneath the veil of stereotypes, our human connections are stronger than our cultural differences." Barakat also mentions the organization, Seeds of Peace. From the site: "Founded in 1993, Seeds of Peace is dedicated to empowering young leaders from regions of conflict with the leadership skills required to advance reconciliation and coexistence." It's well worth checking out. These links, along with Tasting the Sky, will help your child learn more about the conflict between Israeli and Palestine and help put a face to the stories we read about and hear on the news. Winner of the 2007 Middle Grade/Young Adult Nonfiction book, Tasting the Sky: A Palestinian Childhood is Ibtisam Barakat's memoir of her childhood growing up on the war-torn West Bank. The story begins in 1981. 17-year-old Ibtisam is on a bus heading home to Ramallah when Israeli soldiers board the bus and order the driver to take the passengers to a nearby detention center. It is here when we first get a glimpse into the fear that has consumed Ibtisam's life for nearly 15 years since the 6-day war of 1967. As Ibtisam is released unharmed and safely returns home, she takes us back to that day in 1967 when the war was declared. What was a normal day soon turns to terror as three-and-a-half year old Ibtisam, her family, and neighbors are forced to flee their homes. In the rush to get away, Ibtisam doesn't have time to put on both shoes and somehow loses her family and her other shoe. She miraculously finds her family after walking quite a distance barefoot. Her feet are injured, but they must continue onto Jordan where they've been granted refuge. We see the next four years of Ibtisam's life through her eyes--the eyes of a child dealing with the realities of war. We see her parents struggle to protect their children, to keep their family together, and try to maintain some semblance of normalcy. They do have happy moments but are often reminded that the life they once led is gone, that Ramallah is occupied by Israeli soldiers, and that they must always be on guard. A gripping and emotional story, I was drawn in from the beginning and had a difficult time putting the book down. As I was initially reading, I felt I wanted to know a bit more about the history of the war and what was going on politically, but then I realized that Ibtisam Barakat was intentionally leaving this information out because she was telling us the story from a child's point of view. It simply wouldn't have worked if she would have added more historical information aside from the brief note in the beginning. All we see is how a child tries to grip with what's going on around her, and she sticks to this point of view throughout the entire story. It also helped me put a face to war and to the innocent people and children who live in war-torn countries. It also made me realize that regardless of where you're from or what happens in your life, we all have the same emotions. Kids will be able to relate to this book even though they may not have had the same experiences. I recommend this book to everyone, not just children, and I hope it's not the last we hear from Ibtisam Barakat. Check out more nonfiction books at Picture Book of the Day. So, I know I'm a little late with this list, but better late than never! My goal for the year is to read 200 books. Here's how I'm doing so far. So, that's 30 books and 170 to go. I'll need to pick up my pace a little in order to meet my goal....I think I can. I think I can. Poetry Friday: Robert Lowell's "The Quaker Graveyard in Nantucket"
Whenever I find myself growing grim about the mouth, I wear a tourist's shirt with "Nantucket" printed on the front. A nurse who had already done several embarrassing things to me saw the shirt and asked me if I had been there, and I told her I hadn't, there once was a girl had given it to me. I like the shirt because "Nantucket" seems simply exclamatory, and universal enough that you don't have to have been there. That's not just because of many honorary limericks, but because the island once ruled the sea, and deprived it of the world's largest animals. As Melville put it, "Two thirds of this terraqueous globe are the Nantucketer's. For the sea is his; he owns it, as Emperors own empires." Owning the sea means dying in it, especially when you're hunting whales. Nantucket ruled the sea, and the sea was its graveyard, and the graveyard was a function of doing violence to the sacred--to the Leviathan, to the water: "The death-lance churns into the sanctuary...." Robert Lowell's "The Quaker Graveyard in Nantucket" mourns this violence, in the form of an elegy for his cousin Warren Winslow, who died at sea in World War II. Lowell himself was a pacifist who went to prison rather than fight. So the poem is not just an elegy but a rebuke to violence, broadly conceived as war against both nature and fellow human beings. The whale and the sea are points of confluence for this theme, the whale because it is a large animal with religious significance, and the sea because it is both a sacred source of life and yet ready to do violence to it. In a way the whale is the preeminent pacifist, slow, lumbering, peaceful, and lodged in the violent ocean; magnificent but vulnerable to "the kill." Like Mary in the sixth stanza, there is something meditative in it, an evocation of the religious turning away from the ways of the world that makes itself vulnerable to them. That vulnerability leads to a contamination of the sea, as Abel's blood is of the earth: "When the whale's viscera go and the roll/ Of its corruption overruns this world"; similarly for the victims of war: "Atlantic, you are fouled with the blue sailors,/ Sea-monsters, upward angel, downward fish." This reference to Paradise Lost joins man and sea, as does the juxtaposition in the first stanza of the recoil of honorary steel guns and earth-shaking Poseidon. There are costs to treating both human beings and nature as objects of violence, for the sake of commercial exploitation: "All you recovered from Poseidon died/ With you, my cousin, and the harrowed brine." "And meet it is, that over these sea-pastures, wide-rolling watery prairies and Potter's Fields of all four continents, the waves should rise and fall, and ebb and flow unceasingly; for here, millions of mixed shades and shadows, drowned dreams, somnambulisms, reveries; all that we call lives and souls, lie dreaming, dreaming, still; tossing like slumberers in their beds; the ever-rolling waves but made so by their restlessness." And blue-lung’d combers lumbered to the kill. Today, I'm putting a different spin on the third installment of "Building The Well-Read Child's Library." Instead of giving you recommendations for a number of books, I'm going to talk about series books and the role a particular series played in my childhood and ask YOU for your recommendations. Many of you may have grown up with Nancy Drew, The Bobbsey Twins, Anne of Green Gables, or even Beverley Cleary's Ramona Quimby. I myself grew up with Trixie Belden, and Candace Ransom's article about Trixie Belden in February's edition of The Edge of the Forest, a monthly online children's literature journal, has inspired me to write about my own childhood experience with this series. When I was a young girl, I think around 7 or 8, a family friend, Leanne, who knew I loved to read, gave me a box of books she had read when she was a young girl. In the box were a number of books in the Trixie Belden series. Little did she know that a couple of decades later, I would still remember this and remember how such a small gesture impacted my life. Trixie Belden is a freckled-faced tomboy who lives with her parents and three brothers on Crabapple Farm in New York. In the first book, The Secret of the Mansion, she meets her rich new neighbor, Honey, who soon becomes her best friend. Before you know it, they've embarked upon their first mystery when they notice something strange going on at the old, abandoned Frayne mansion. Who is the boy sleeping in the house? Who is he running from? What will happen to him? After reading this first book, I was HOOKED on the series and immediately fished the second book out of my box. The boy in the first book was Jim Frayne who becomes a central character in subsequent books in the series. Wherever Trixie and Honey go, a mystery awaits them, and they soon form a gang, The Bob-Whites, with their close circle of friends, who solve all kinds of mysteries in the 39-book series. Why did I love Trixie and her friends so much? I loved the adventures, the stories, the down-to-earth characters. I longed to have Di's violet eyes and admired Trixie's intelligence and integrity. Honey had what I didn't have and what her friends didn't have, yet she was generous and kind. I had a crush on Trixie's smart and handsome older brother, Brian. In short, I felt I KNEW these characters. I was drawn into their world, and I looked forward to reading the next book to see what they were up to next and to see how they progressed. I was so excited to learn through Candace Ransom's article that Random House has re-released the first 13 of the 39 books in the series. Now a new generation of children can get to know Trixie and her friends. Good series books draw readers into the lives of the characters. We care about them. We get to know them. We want to know what happens next. We can't wait until the next book comes out. One book is not enough. We. must. have. more. Take the Harry Potter phenomenon. Kids and adults (I was one of them) stayed up until midnight so they could get their hands on the newest book in the series as soon as it came out. We were entranced by J.K. Rowling's words and stories. We wanted to know what would happen to Harry and Voldemort. Who would live? Who would die? Would Ron and Hermione fall in love? Would Harry ever find happiness? Would Hogwarts be destroyed? That's the magic of series books and why I love them and think every kid should get the opportunity to get hooked on a series. So now I'm appealing to you...I want to build a list of the best series out there. What did you enjoy as a child? Why? What does your own child love? If you have trouble getting your little ones to eat their vegetables, give this book a try. After reading about "jiggly, wiggly, wobbly worm cobbler" and "hairy, scary spider cookies," broccoli will sound delicious. Arnold Chipper, a young bear, enjoys making "food" in his garden, but it's not edible at all. His siblings, Maria and Albert, are appalled by his gross (but creative) concoctions, but when Arnold begins to eat a handful of seeds, Maria shows her brothers how to plant them. Soon Albert is able to make healthy and delicious meals for his family. 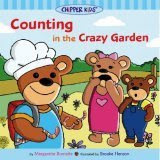 A book suited for preschool-aged children, Counting in the Crazy Garden teaches numbers and counting from one to ten through Arnold's dishes. For example, he makes "one jiggly, wiggly, worm cobbler," "two tall tubs of tumbleweed soup," and so on. To make the connection between numerals and the spelled-out words, when Arnold presents his dishes, the numeral in red is in the upper corner of the page and the spelled out word, also in red, is in the text. There's even a little lesson on how to plant seeds and grow food. The illustrations themselves are very simple and will appeal mostly to young children. While older children may enjoy the story, they may think the pictures are too "baby like." However, the story itself is engaging and will make children laugh and also turn their noses up at the yucky foods. I imagine them saying, "ewwwwwwwww" and giggling as they read the story. A fun take on traditional counting books, this is a nice choice for parents who are helping their children learn to count and recognize numbers. I also think it would make a good board book.